There are roughly two types of methods for connection of terminals on AnyWireASLINK. One method is the “2-wire (non-insulation) type” and the other method is the “4-wire (insulation) type.” For basic configuration of AnyWireASLINK, connection with the 2-wire (non-insulation) type is assumed. Not only the transmission signal but also power to operate the terminal and equipment on the load side are superimposed on these 2 electric wires. A 4-wire (insulation) type is a terminal used when the current capacity on the load side is not covered by supply current of a 2-wire (non-insulation) type, and responds to both power supply from the master side and power supply on the local side. Furthermore, when connecting to external load for which power of the other system separated from AnyWireASLINK is used, make sure to use a terminal of a 4-wire (insulation) type. Total length also includes the cable section of the terminal with cable. Size of the cable section of the terminal with cable is not included in this condition. Maximum current value on the left is obtained by adding operation current on the terminal and current on the load side. When consumption current above the maximum current value is required, use 4-wire terminal which allows for local power supply. When 2-wire type and 4-wire type are mixed, there is no problem if current value obtained by adding current on the load side of the 2-wire type section and operation current on all terminals of the 2-wire type and 4-wire type is within the maximum current value on the left. Number of wirings is decreased. This type can be used with power supplied only to the master side. This type can be used for load of the closed circuit such as a sensor and LED. 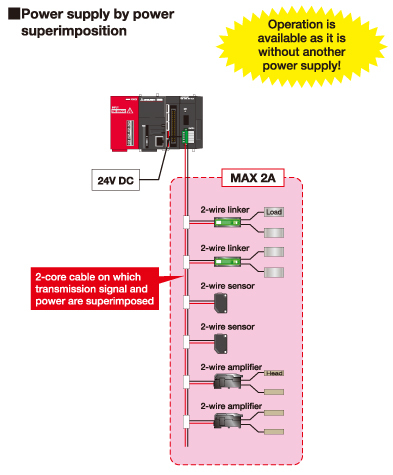 Power of maximum 2A is supplied to the local through transmission line. 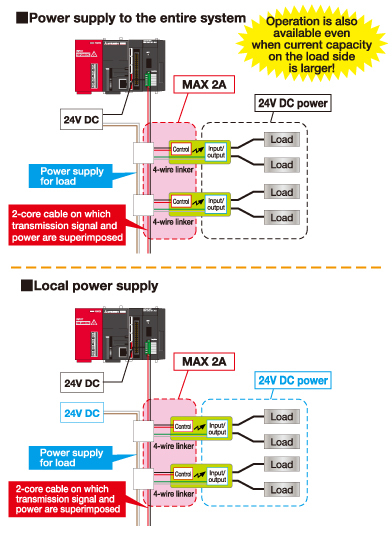 Load with large consumption current can be used. *1 ASLINKER of IP67 structure is also included. *2 Without 7 segment display/IP65 is 2-wire type (non-insulation), and with 7 segment display is 4-wire type (insulation).